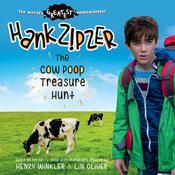 Underachiever Hank Zipzer goes on an unfortunate school camping trip in a comical, kid-friendly novelization of the popular BBC series based on Henry Winkler's best-selling books. What will it take for Mom and Dad to trust Hank to go to the mall unsupervised with his friends? Cooking a family dinner — er, disaster — doesn't exactly say “responsible.” But what if Hank signs up for the school's notorious survival camp and makes it through the whole weekend? Maybe he should factor in being teamed up with his nemesis, McKelty, in a leaky tent, not to mention a desperate search for a cell phone in a field of cow pies. . . . The amiable character originated by Henry Winkler — inspired by his own childhood — comes to life in a humorous adventure set in a font designed to boost readability for kids with dyslexia. Henry Winkler is admired by audiences of all ages for his roles as the Fonz on the long-running series Happy Days and in such films as Holes and The Waterboy. He is also an award-winning producer and director of family and children’s programming, as well as the author of the critically acclaimed Hank Zipzer series with Lin Oliver. He lives in Los Angeles, California. Lin Oliver is a television producer and writer and the executive director of the Society of Children’s Book Writers and Illustrators. She coauthored (with Henry Winkler) the New York Times bestselling middle-grade series Hank Zipzer: The World’s Greatest Underachiever, and wrote the series Who Shrunk Daniel Funk? Lin resides in Los Angeles, California.